These are rich, creamy, and very cheesy, hence, the truffle nomenclature. Typically, I made this as a large cheeseball or cheeselog, which was very good on crackers and with fruit, but I always felt it lacked a certain contrast of texture. It finally dawned on me that the texture contrast I sought could be easily remedied by making a smaller version, as in a two-bite size. The exact contrast of textures that I wanted – creamy and nutty in every bite. Perfection. In a food processor, combine cream cheese, cheddar cheese, and blue cheese. Pulse 5-8 times to mix together. Add chives 1/4 cup of pecans, 1/4 cup almonds, bacon, onion, garlic, cayenne, and worcestershire. Pulse a few times until well mixed. Remove from processor bowl onto a piece of parchment paper or plastic wrap, form into a flattened disk, and chill in refrigerator for 15 minutes. Using a small cookie scoop, portion out cheese mixture and place onto a piece of parchment paper. For rolling the truffles you will need two rimmed pans or plates. I used aluminum cake pans for easy cleanup. Combine the remaining pecans and almonds together. In one of the aluminum pans, spoon in 3/4 cup of the nut mixture. 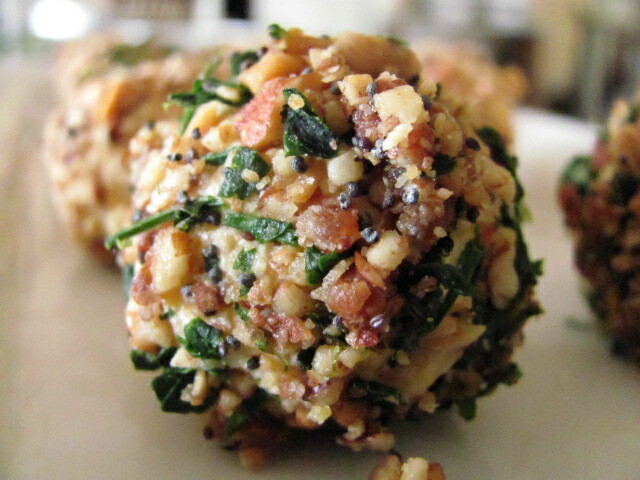 In the other pan, combine the remaining nut mixture, the parsley, and poppy seeds. 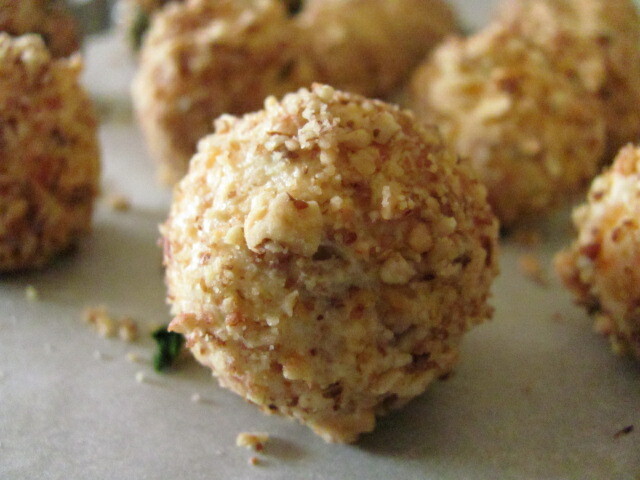 Roll half of the truffles in nut mixture and the remaing half in the nut, parsley, and poppy seed mixture. Place on parchment paper, and refrigerate at least four hours. Serve with crackers, crudites, and/or sliced apples and pears. Mmm, so tasty! 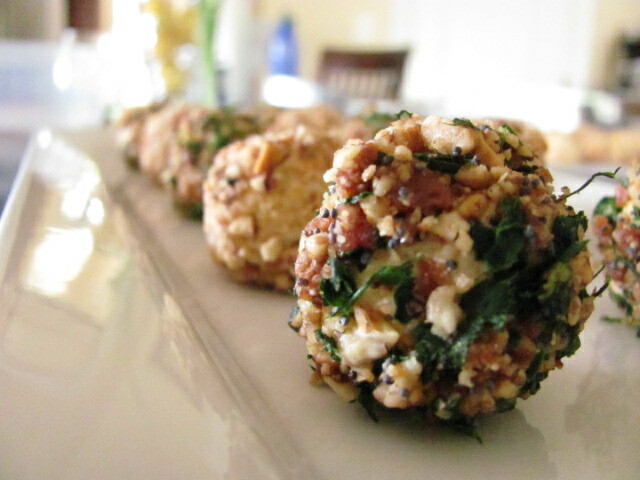 Cheeseballs are one of my favorite holiday appetizers! Thanks so much for linking up to Saturday's Party! I hope you come play again! I may make these for Jerri's crawfish boil this Sunday! Wow – do these look good! I love the flavors. I'm impressed that you made a video – good luck!